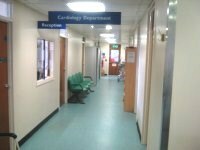 Cardiology is located to the rear of Corridor B. This venue is situated in West Bromwich. 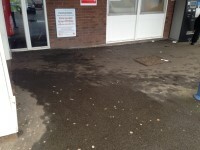 The nearest mainline station is Sandwell & Dudley. 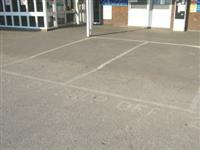 The dimensions of the Blue Badge parking bay(s) are 360cm x 560cm (11ft 10in x 18ft 4in). The nearest Blue Badge bay is 10m (10yd 2ft) from the Outpatients entrance. 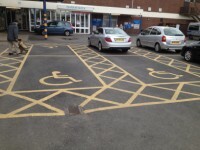 The furthest Blue Badge bay is 22m (24yd 2in) from the Outpatients entrance. 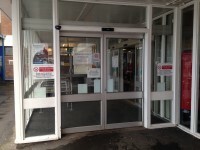 The drop off point is located at the front of the Outpatients entrance. 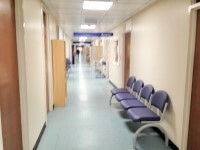 You are on Level Change (Outpatients Entrance). Skip to the next section. 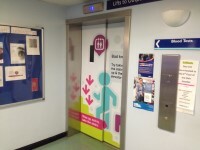 The lift is located within the Outpatients waiting room. 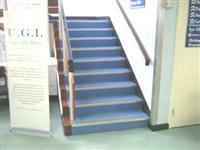 The lift is 25m (27yd 1ft) from the Outpatients entrance. The clear door width is 113cm (3ft 8in). The dimensions of the lift are 140cm x 230cm (4ft 7in x 7ft 7in). You are on Outside Access (Unit Entrance). Skip to the next section. 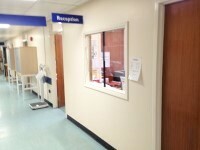 This information is for the entrance located on the first floor of the Outpatients department. 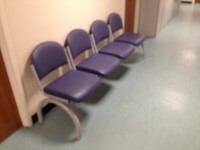 The waiting room / area is 17m (18yd 1ft) from the reception. There are not doors into the waiting room / area. The type of flooring is vinyl. 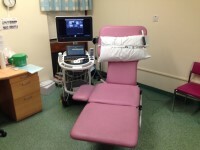 There are 4 consultation/treatment rooms available. The room surveyed was Echo 3. 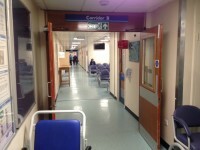 The consultation / treatment room is 20m (21yd 2ft) from the reception. 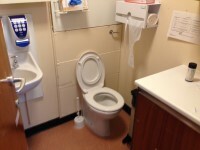 Adapted toilet facilities are available within the Outpatients main waiting area. You are on Standard Toilet(s) (Specimen Toilet). Skip to the next section. The unisex toilets are located off Corridor B.
Unisex toilets are 20m (21yd 2ft) from the unit entrance.